I was inspired to make this card after a friend shared a card she made that was white on white. White on White, or any monochromatic project can be a little tricky but it doesn’t have to be dull! One of the best tips to keep in mind when working white on white (or color on color) is that since you don’t have colors, you need to work with layers and texture and dimension. Who needs lots of color when you’ve got all that going for you? Notice all the layers? First is my Whisper White card base. Then comes another, smaller layer of Whisper White that was embossed with the Gently Falling TIEF. A little strip of Botanical Gardens Designer Vellum, stamped with a sentiment in Silver, is wrapped around this layer prior to adhering this to the card base. (Even this vellum is white on white!) This tiny bit of silver ink is the only ‘color’ on the entire card! Now for the focal point! I cut out a heart from Whisper White cardstock using the Bloomin’ Heart thinlits and several flowers as well. The Big Shot die brush makes easy work of getting all those little pieces out of the intricate design. Stampin’ Dimensionals strategically placed behind the 5 flower areas prop this heart up from the embossed background. Next I curled the flowers and using pieces of dimensionals, adhered the flowers to the flower spaces. On the 2 larger flowers, I added a smaller flower on top of the larger flower. Each flower was then topped with a Pearl. Lastly, a piece of Organza ribbon was adhered on top of the heart for yet more texture & dimension. You can see the layers and dimensions in this view. 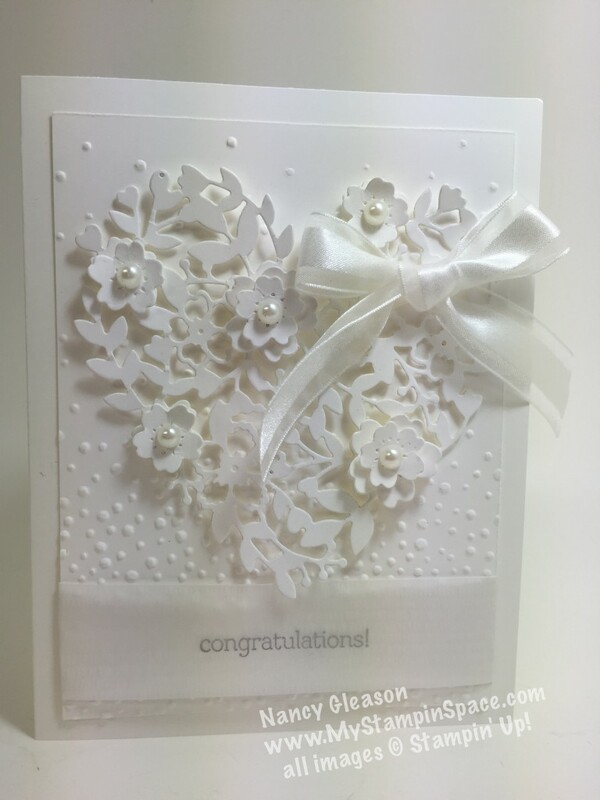 While I originally made this card as a Congrats on your Engagement, I thought it looked more ‘bridal’ and decided to use it as a Congrats on getting married instead! My Rose Wonder bundle was on it’s way, so I waited, then added the sentiment “Wishing you a marriage made in heaven and a lifetime blessed by God” to the inside. If you don’t have a Stampin’ UP! 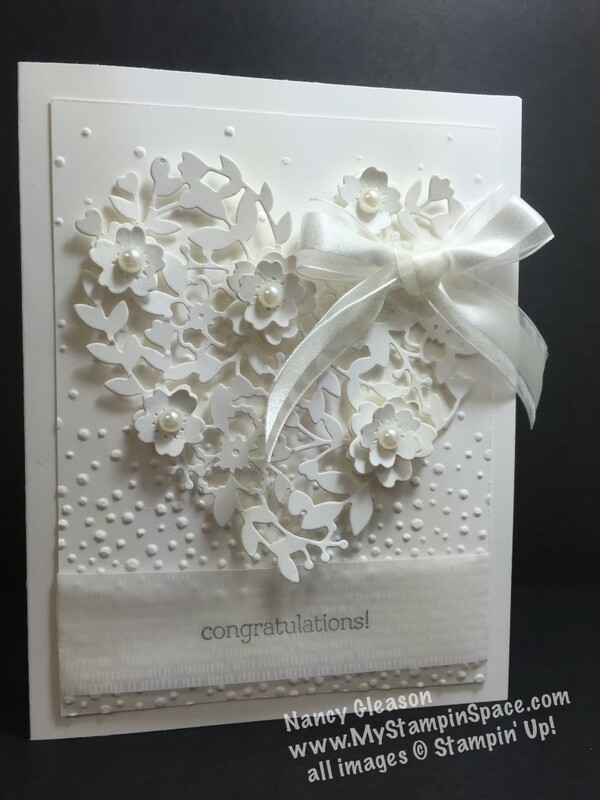 Demonstrator and want to order any of the supplies I’ve used here to create this card, I’d be honored to be your demonstrator! Click here to start shopping, or click on any of the items below. This die is part of a product suite that includes a coordinating stamp set and designer series paper, as well as embellishments. And you can bundle & save when you purchase the die and stamp set together! Don’t forget, with every $50 in products (before shipping & tax) you will earn 1 FREE Sale-A-Bration item! What is Sale-A-Bration? CLICK HERE to learn all about Sale-A-Bration and why you don’t want to miss out on this limited time promotion! To keep the creativity coming every month, Subscribe to Paper Pumpkin. Order a prepaid 3 month subscription and SAVE $. (You can even “GIFT” this to a crafter of your choice) AND select 1 FREE Sale-A-Bration item. Please leave me a comment below and let me know how you liked this project today! I love to hear from you. Pingback: 27 Paper Crafting Picks to Inspire You! 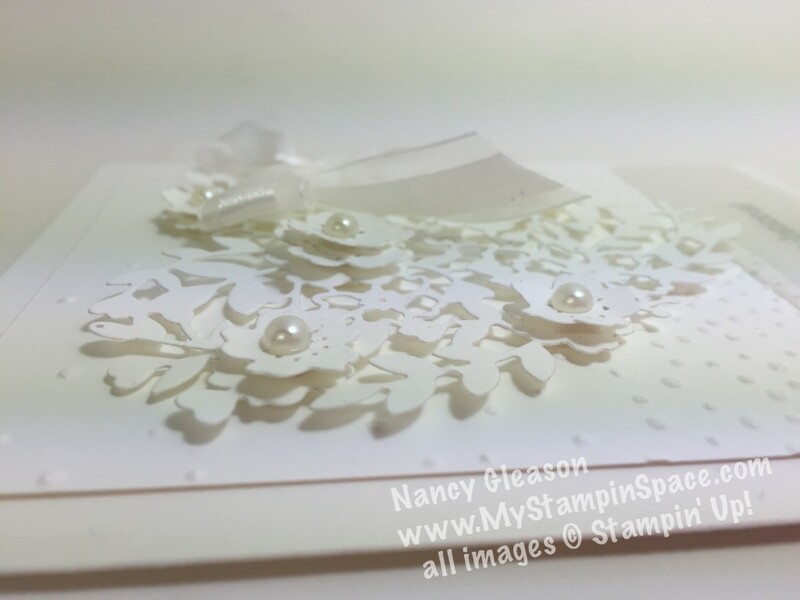 – Mary Fish – Stampin' Up! This is so beautiful! A keeper. This is absolutely beautiful. I just became a ‘hobby’ dealer. I will be sure to follow you with your great creativity. CAN YOU MAKE THIS CARD FOR ME? IF SO HOW MUCH? CAN YOU WRITE INSIDE THE CARD WHAT I WANT TO SAY AS WELL? CAN YOU ADD A SILVER LINED ENVELOPE AS WELL? PLEASE LET ME KNOW ASAP THANK YOU. I DON’T KNOW WHAT YOU MEAN ABOUT WEBSITE?